Opis: As the 1990s began, the only planetary star system known was our own Solar System. The first extra-solar star system was discovered orbiting a pulsar in 1991. Slight changes in the precise arrival times of the pulses from the central small dense neutron star gave evidence of orbiting planets. By mid-decade Jupiter-like planets around Sun-like stars were being found by a slight wobble detected in the motion of these stars. 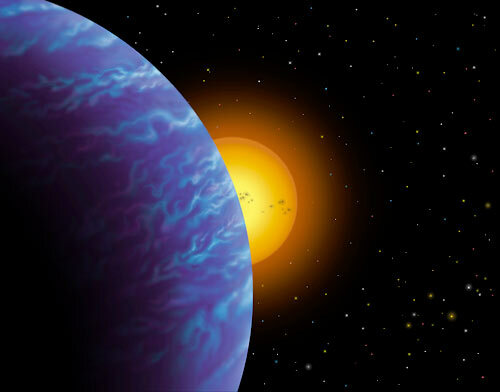 Pictured above is an artist's sketch of a planet discovered orbiting HD217107. As the decade comes to a close, over two dozen planetary star systems have been identified, one recently confirmed by the detection of a slight eclipse by the planet itself. An unambiguous discovery of Sun-like star systems containing Earth-like planets still remains a goal.